My hardwood floors are finished and I’m finally getting around to updating on the progress! I’m so happy with how things are coming together around my house. With the kitchen remodel going on at the same time things have been really crazy around here, but I was finally able to get my dining room set up again. I’m very excited to finally be at the stage where we can put things back and set up most areas of our house again! Fall nesting, here I come! The Hickory hardwood floors make such a dramatic difference in how my house feels.I love how they fill each room with light, texture and help pull together the classy but casual vibe I was hoping for throughout my house. Because we went with prefinished floors, I was able to have the floors put in with a minimum of fuss and dust and the turnaround time was minimal. I think the floors look really fantastic and I am very happy with the new stairs, too! I was thrilled to be able to work with Lowe’s on this hardwood floor project this summer. By partnering with Lowe’s, I was able to cross off another one of my Home Dreams for 2012, so a big thank you to them for their support of this project. I have been having fun figuring out what direction my house will go now that the new floors are a big part of the overall style of my home. Where I felt the carpet was distracting from my intended style and kept me from really establishing the look I wanted, the hardwoods have really brought in a fun new element to work with! I’ve been simplifying my furniture pieces in each room and streamlining my rooms to have less “stuff” so the real beauty of the room can shine through. My goal is to only put back into the space things I actually really love and use. While I am still re-using many things I already had, it is fun to mix in new items too as I’m able. I decided that while both the baker’s rack and armoire (that were in the dining room prior to the hardwood floors) were great pieces of furniture, less was going to be more in this room. Without the extra cabinets, the room breathes so much better and we actually are more compelled to work or eat in this room, since there is plenty of elbow room! We’ve worked out other areas in the house for storage so we could do without those pieces of furniture (the white armoire is going into an upstairs bedroom so it is staying in the house!). To pull this room together once the floors were in, I knew I wanted four new chairs. I’d been looking at the woven gray Kooboo arm chairs for so long at World Market. I’d go in, stare at them, ask about them. Imagine them in my dining room. Want them. And then I’d go home without them. Finally the chairs I wanted were on sale this weekend and I knew the time had come. They only had three left so I brought two of them home! They are PERFECT for my dining room! The texture is fantastic and the scale is great for my rather small dining room. I also loved those gray metal chairs from World Market. Since they were on sale this weekend as well, I decided to mix two gray metal chairs and two grayish woven chairs together at my existing white table. And, as needed, I can still pull in my black metal chairs (currently on loan to my church) for extra seating. For art, I brought in our 1800’s oil painting for the right wall of the dining room. The beautiful colors and coastal mood are perfect for this dining space. That painting came out of my old house (we bought it for $100 from the seller when we were moving in) and later found out it is an original from the Impressionist era, and the artist was a friend of Monet. I have a beautiful HomeGoods driftwood mirror that was supposed to go on the left wall, but after many failed attempts at hanging it (it was heavy and my drywall was being difficult) we opted to add more plates to instead (to cover the 5,000 holes we made trying to hang the mirror). Someday we will tackle hanging the mirror again. Sometimes DONE is preferable to frustration. So is my dining room complete now? Ha ha ha. Is a room ever done when you love the process of tweaking? I think not. This room, and other rooms in my house, are actually more in evolution than a quick and easy before and after. Every year I make more progress and refine my style a little bit more. That is the fun of decorating, it never has to be done if you are still enjoying the process. You can enjoy each step of the way and still have fun growing and changing! Next year this room might look entirely different, but this is how it is for now. My house is really evolving to be what I feel is a good style for me. I love the mix of natural materials, like the woven chairs with the mixed metals on the lantern and chairs. That character combo really seems to work well in my Craftsman house to give it both a vintage vibe with modern edge. To make even more progress on this room down the road, I need to repaint my dining room table, finish up the ceiling which still has an unfortunate band of swine, and paint the baseboards. And you never know, the current color on the walls might still change without warning! I love the color it is now (studio taupe by Behr) but I have an idea for the room that might someday mean the walls could no longer be gray. Just keeping my options open! But while it seems like there is still a lot to do, we’ve really made quite a bit of progress over the past few years. See where we started? That before photo, above, of my dining room is hardly even recognizable. That photo was taken as we moved in so it wasn’t staged or set up to my liking but you can really see what we started with. Swine walls, yellow/brown carpet and a flying saucer for a light fixture, all gone. This room has evolved step by step with a little tweak here and a little update there. Three and a half years later, this is what we have! I had to be patient for 10 long months waiting for my old house to sell so I could move all my furniture here. I put up my antique stained glass (from a real church) to hide a less than pleasant view. I painted my old table, chairs & armoire to brighten up the room and unify mismatched, less than lovely wood. Then right before the holidays in 2010 we painted the walls Behr All in One Studio Taupe Paint. Then in February 2011 I got a new lantern with lots of character. And then, I moved the dresser out and put in my baker’s rack. Next, I got new chairs. In summer 2011 I hung my 17 year old re-purposed blue and white curtains. We removed the carpet and furniture this June to have new hardwood floors installed. Fast forward to today, we have new hardwood floors and more new chairs! And there you have it! 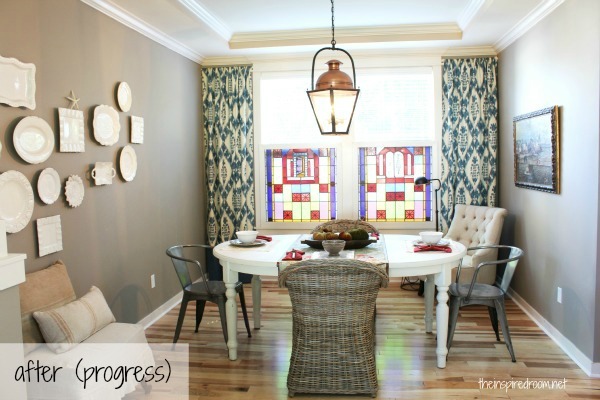 The dining room progress report and before and after update. Now I’m ready for Fall! Want to see the adjoining room and its makeover? See the Living Room Makeover & Update here! 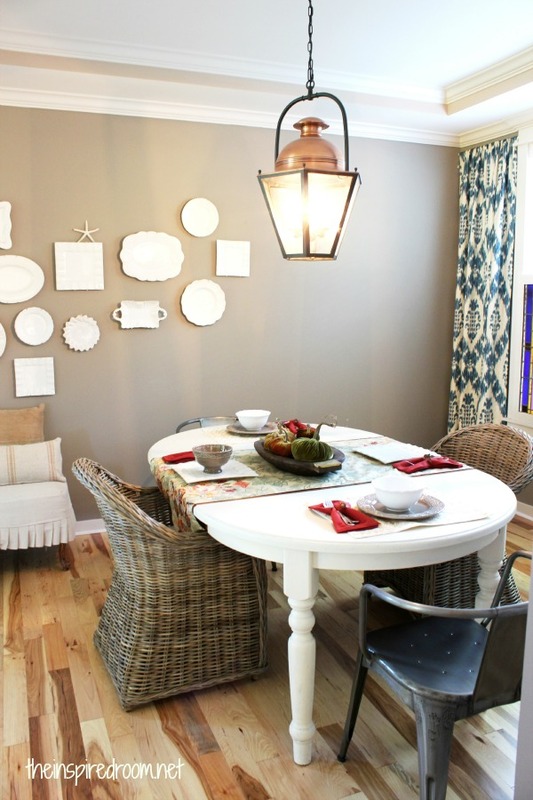 Want to see the Spring Dining Room 2013 update? 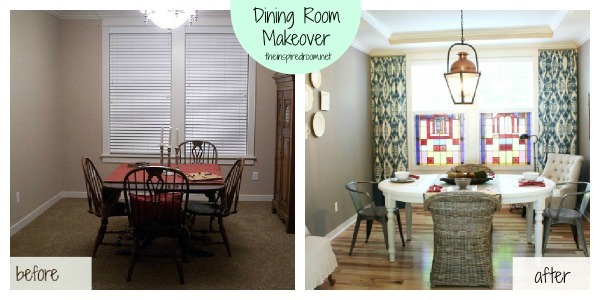 love the transformation of your dining room! What progress has been made in the kitchen? The kitchen is functionally done :-) but we are waiting on the cabinet painter. It could be October before it is painted. Grrr. Meanwhile, I’m working on my pantry and some other things around the kitchen, like painting and installing sconces. I’ll be giving updates soon! I love the transformation! The hardwoods are lovely! I dream of the day we can afford to place hardwoods in our house! Love the floor, the stained glass windows, the chairs and the white plates on the wall! hard to believe it is the same room! it is beatiful! The space looks beautiful and cozy and a place where I would want to share a meal. Great job. Super-great update! I love it. Your floors are so pretty and the room looks fantastic, Melissa! The thing that really pops at me from the before and after is how hanging the curtains to the side of the window makes the space look SO much bigger!! I love that trick. Enjoy your space! it’s gorgeous!!! i love those curtains and love the color from the window…. and of course the chairs… and well, all of it. I appreciate so much how you noted that it took time and patience. It’s hard to see beautiful finished projects and not go out spending money all willy-nilly to get it done quickly. Thank you for sharing your beautiful, inspiring new space! Thank you, I definitely have taken my time and enjoyed the room each new step of the way! 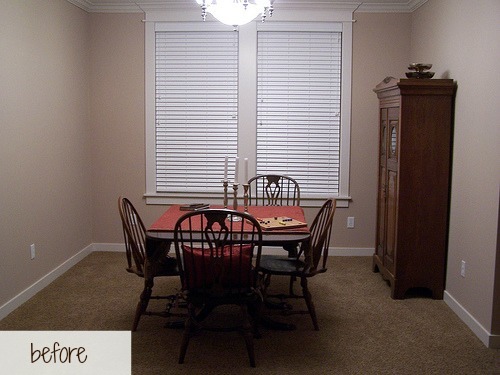 Doesn’t even look like the same room so you definitely succeeded in changing the feel of it! Awesome! Love those floors! I love before and after shots. Your dining room is unrecognisable to me and that is a sign of a successful makeover. I am currently looking for some design tips for my own dining room makeover and certainly found some inspiration here! this is just wonderful! I love the windows! they are beautiful! and the floors, so fab! also, it’s great that the chairs are mix and match! Also, I was immediately drawn to your new drapes. My mouth dropped when I saw the before and after. What a wonderful transformation. you should be so proud! great job! Thank you Heather!! It is very fun to see things evolve over time and I do LOVE it! 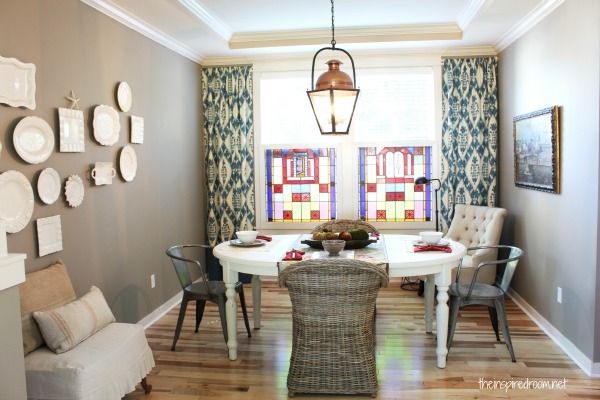 Love your new dining room! LOVE the curtains and stained glass. I know you are loving this space. Thank you, I am very excited to see things progress and we are definitely enjoying it! 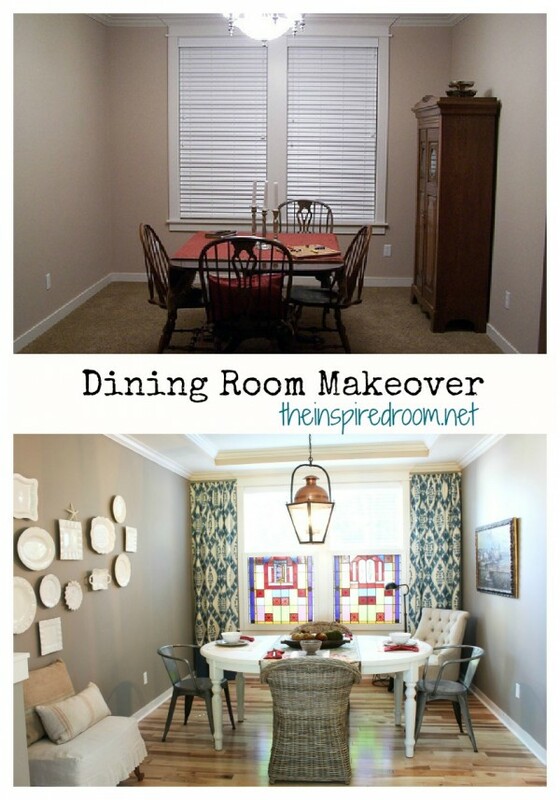 Your dining room looks fantastik, bright and cheery! Love it. Such a change. So much personality. It is just beautiful. great! I see you moved the chair from your office! where did you get the hangers for your plates? anywhere? Yes, that is one of my office chairs! Probably will go back in the office at some point. The plate hangers come from all over, whenever I see them I pick a few up to have on hand. I find them at hardware stores, Target….places like that. One word. OBSESSED. Melissa they looks so beautiful!! This is so funny! I have a pedestal table that I am about to paint white, and those two types of chairs are on my list to add to our dining room. It is so neat to see it in person – looks fabulous! Your new floors are gorgeous. Love the plate wall, the chairs, the draperies – a beautiful space for you, for family, for friends. Melissa, it looks fantastic!!! I am so very happy for you. Good things come to those who wait. We’ve been in our house for 22 years, and it still constantly evolves. The room looks great. I think I like the use of 2 different chair styles the best. I’d love an update in a few months on how the floor holds up with the dog. We have brand new hardwoods (not picked by us, put in before we moved in) and our 50lb goldendoodle has made a mess of them. I’m afraid we’ll be replacing them sooner rather than later (I think the wood is too soft to make refinishing an option). Fortunately I can tell you right now these are real hardwood floors that can be refinished and do stand up to wear and tear. I’ve had the same floors in the kitchen and entryway for three and a half years, that is why I decided to continue on with installing the same flooring, I love it! My entryway and kitchen does need to be refinished at some point due to the kitchen remodel and to get them up to the same condition as my new floors. But I accept normal scratching and wear and tear as part of the character. Dogs to tend to add their own character to floors :-). This type of wood is perfect for that aged over time look because of all the grain and character of the wood. If they were all dark and one tone, those imperfections would be more obvious and perhaps less desirable. If you get new wood floors, it really helps to go with very hard wood and a grain that ages well. Beautiful transformation. What a beautiful change and so much brighter in the room. I have stared at those same chairs myself. They haven’t come home with me yet. I love your floors. I’ve been a model home cleaner for 11 years, seen styles come and go, but the wood floors never look dated. They are first on my list of changes to our home. Thanks for the inspiration!! A bit off topic, but I just wanted to share how much I appreciate your version of truncated posts. I read my blogs through google-reader. I totally understand the reasoning for truncation, but I must admit I usually hate truncated posts for things that are mostly visual because they give no images and don’t tell me enough to decide to click through, but I think the way you’ve done it with one photo and a thorough description is really great. Oh good! Thank you for letting me know! I really want it to be as easy as possible so I’m glad it works! It is just beautiful! My favorite parts are the colors you chose and the chairs you selected. I simply love how one pair is hard and sleek and the other set is rounded and cozy. Congratulations on a job very well done and I am sure you are thrilled to be done and enjoy your space…and fall. Your dining room looks wonderful!!! I love your hardwood floors, they’re beautiful! And those curtains are rad… Love the way you decorated! Goodness Melissa…your style has really evolved from the days of your old house. You are more eclectic, to say the least. Your “new” rooms have a real vibe. Nothing boring for sure!!!!! Are those cute wicker chairs high enough for the table? I love the look, but wonder if they’re comfortable for eating. Have fun decorating. I know you will!!! My old house was an English Tudor so it is fun to express myself in new ways with this house. I love the freedom to be creative using both things I’ve had in my old houses and new things to keep my style fresh! And absolutely the chairs work great at my table! They are dining chairs so they fit a table! Wow. What a huge difference! It looks like a totally new space. Amazing. Congrats. I know you must be so excited!!! How did you hang those plates? I don’t see the traditional plate hangers! Thank you so much for sharing your process. That is the great gift of this post and your blog. I can so relate to staring at chairs and waiting and rearranging and adapting to the space you have. I can imagine homey intimate dinners. I love the mix of materials. And I bet with the success of the blue in your office you are thinking about picking up some of the color in those stained glass windows? What a huge difference, so pretty. You must be so happy with how wonderful it is looking. I really like the look. Beautiful job, Melissa! 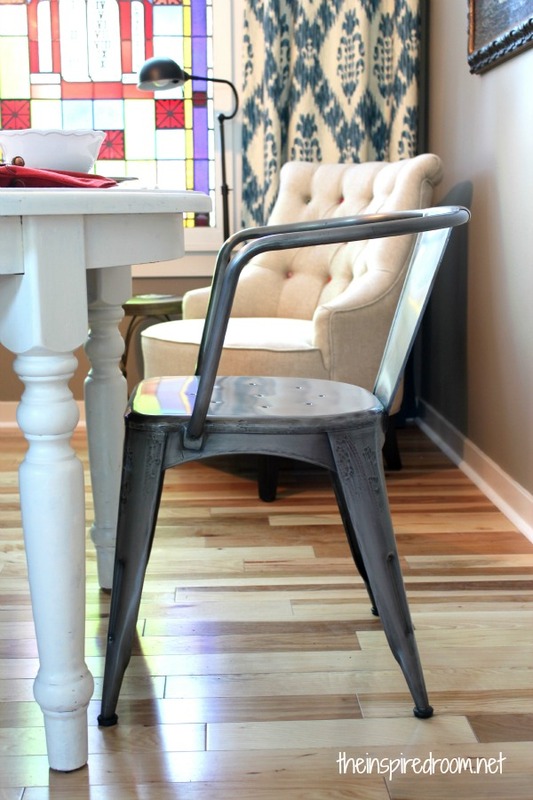 I love that you’re mixing old with new and those floors are gorgeous! This is absolutely stunning! I love the hard wood floors, gorgeous. And the chairs are fabulous. I love how you mixed different finishes and textures. Sometimes it doesn’t all happen as quickly as we’d like but it sure looks like it was worth the wait. Enjoy your beautiful new space!! So beautiful Melissa! I love the collection of chairs! And I very much appreciate the evolution of this room over time. Patience in this fast paced home decor internet world is an attribute I desire! Your room feels collected and thought out and I just love it! Isn’t it amazing what a couple kooboo chairs can do for a space? I added two to our dining room table as well, both from World Market. Kooboo can be dressed up or go casual, I will send you a pic sometime. I really like what you’ve done in your home, lived in and loved space! that spells happiness to me. gorgeous! love thos wood floors! 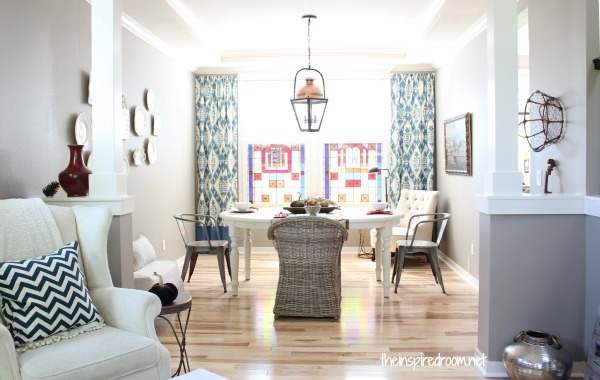 Love everything about this room…the floors, the table, those gorgeous drapery panels! Beautiful job! Enjoy the fruits of your labors! Oh my goodness. Love those floors Melissa. They’re gorgeous! Congratulations on the completion of a room, though it seems no room is ever really complete…at least not in my house! I like the fact that you know and embrace the fact that your house is evolving. It’s actually looked nice at every turn, but now with those floors it looks beautiful! I can’t believe how much BIGGER it looks. The floors are amazing, and your choice of color and accessories are gorgeous. my goodness the floors and the beautiful wall curtains that flank the windows make the room look HUGE! What a difference! Congratulations! This looks amazing!! I love your style!! Can you please tell me where you found the curtains? I love them!